GeoShred expressive musical instrument with a multi-touch performance surface, coupled with an advanced physical model of a guitar. Virtual guitar based on physical modeling technology; an alternative musical instrument, accompaniment and song writing. PowerStomp (under development) – Full effects chain for amplified instruments; runs on mobile devices and tablets. 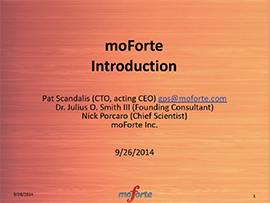 Based on moForte’s modeling technology.